We have put together these special resources to help you claim the abundant life available to you because of Jesus, the Good Shepherd. With your generous gift of any amount, receive Pastor Bobby’s new 4-message series, Living a Life Without Lack, plus the Psalm 23 Provision booklet. 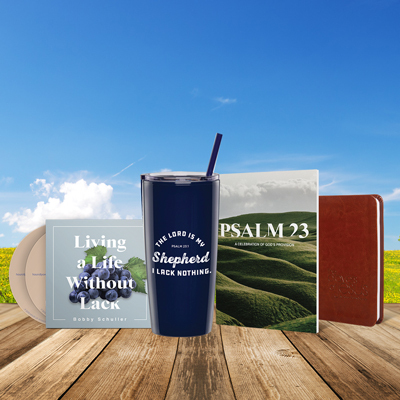 With your gift of $100 or more, receive The LORD is my Shepherd tumbler, The Prayers of Jesus: Living in the Psalms workbook, Bobby’s Living a Life Without Lack 2-CD series, plus the Psalm 23 Provision booklet. Jesus is the Good Shepherd and because of Him, you can lack nothing!